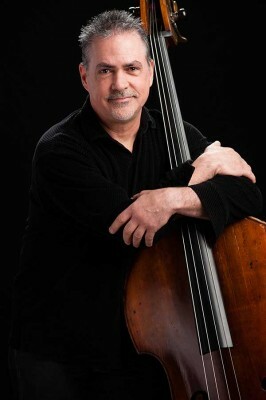 Bassist Kevin MacConnell’s impressive career has taken him from playing with orchestras on concert stages to Broadway shows, from numerous recording studios to the sets of television shows, from jazz festivals to great clubs. He has performed with such jazz legends as Mel Torme, Nancy Wilson, Billy Eckstine, Joe Williams and tenor saxophonist, Ernie Watts and made national and international television appearances/performances with Diahann Carroll, Marilyn McCoo, Merv Griffin, Natalie Cole and opera diva, Denyce Graves. Highly respected on the jazz scene, Kevin performed recently with John Blake and Jimmy Bruno and continues to tour the country with a Philadelphia based classical/blue grass ensemble “The DePue Brothers Band.”, which features two members of the Philadelphia Orchestra, as well as blue grass legends, Mark Cosgrove and Tony Trischka. Recent recording credits include Profile, Larry McKenna; Earth Tones’, Power of Ten; ‘Unencumbered’, Mark Cosgrove and Director of the Ira Brind School of Theater Arts, Charles Gilbert’s prerecorded productions, “Harold and the Purple Crayon” and “Sylvester and the Magic Pebble”.